CRUISE #2: Fun & Sun. Departure from Ouranoupolis. 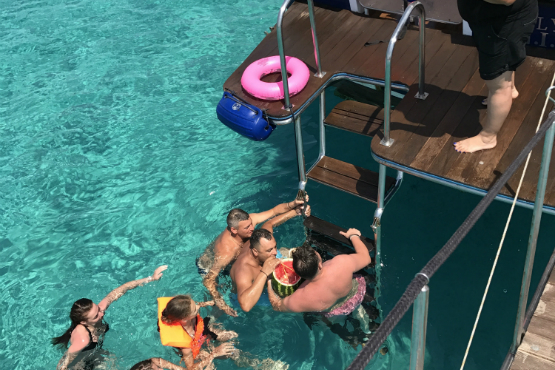 A whole-day cruise for swimming, snorkeling and fun in the sun with barbecue, in two magnificent spots of Halkidiki. Departure from Ouranoupolis. 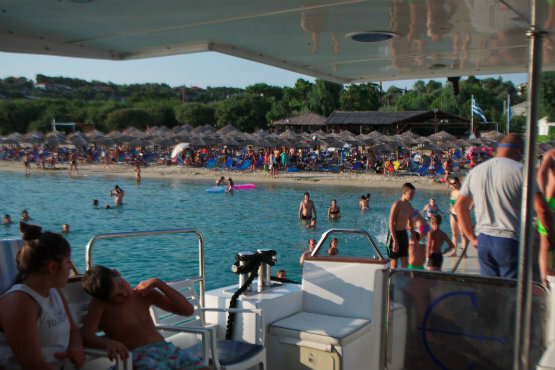 This cruise is offered every Sunday and starts at 10:00 from the port of Ouranoupolis. 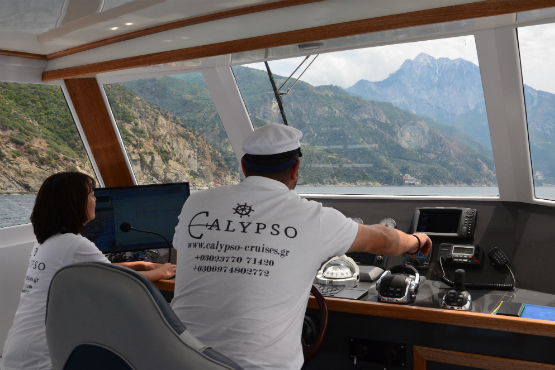 After our departure we head toward "Blue Lagoon", which is located just opposite Vourvourou in Sithonia and is the first stop of our cruise. 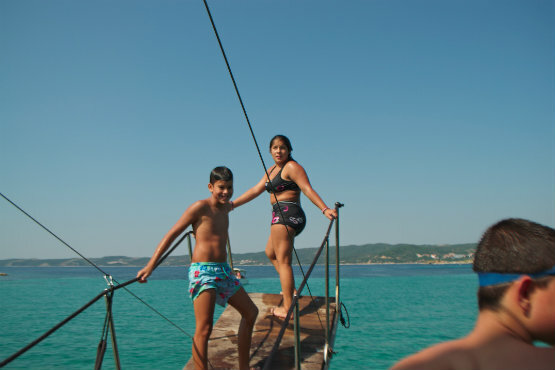 The trip to Sithonia lasts for about one hour during which you have the chance to enjoy your morning coffee while sailing on the calm waters and feeling the morning breeze of the sea. And don't forget to keep your camera ready for some spectacular photos of dolphins which very often swimming in front of our bow! 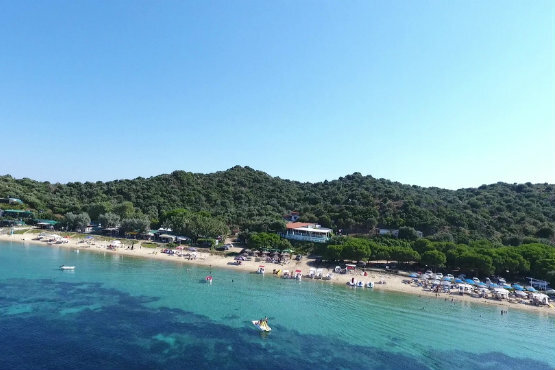 Blue Lagoon is an extraordinary marvelous place that cannot be found anywhere else in Halkidiki. A small strip of sea between the islands of Diaporos and Agios Isidoros, which are two of a complex of nine islets located in a very short distance from Vourvourou. The "Blue Lagoon" is an exotic place with a combination of a white sandy sea bottom and shallow depth that creates a very light glacier blue color to the water. The exquisite natural beauty surrounding this place makes it an ideal destination for swimming and relaxation. We’ll spend the next two hours here for swimming, snorkeling and enjoying all the fantastic scenery this place has to offer. Here you’ll also have the opportunity to explore the endless hidden coves of this exotic place. 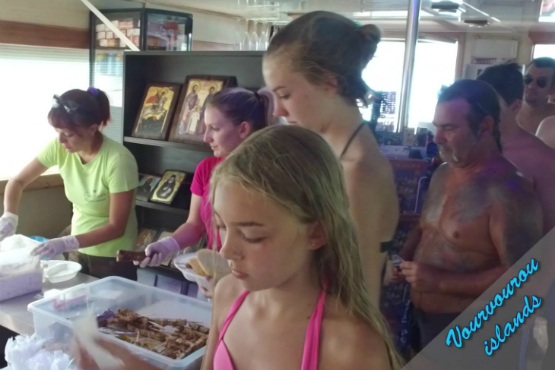 Upon returning to the boat a delicious barbecue with salad, bread and complimentary wine or refreshments, are awaiting you to recharge some energy. And if you're a vegan you don't need to worry, just contact us at least one day before the cruise and we will prepare something especially for you. 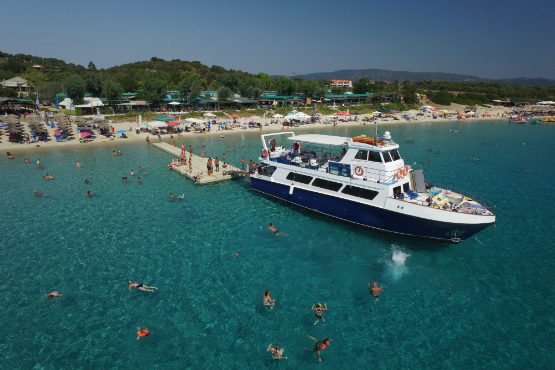 While you are enjoying your lunch we're raising the anchor and set sail to the second stop of our cruise, the beautiful beach "Alykes" which is one of the most popular “Blue Flag” beaches of Ammouliani; the only inhabited island of Halkidiki. It is one of the most beautiful beaches of the island and located on the south-west coast of the island with a view of Sithonia peninsula. It is a crescent-shape sandy bay with shallow water, very suitable for small kids and families. Upon arrival to the island we'll spend about 1 hour and half here where you have plenty of time to swim in the crystal turquoise waters, relax under the sun in one of the sunbeds and parasols of the well organized beach or visit the beach-bar for a refreshing cocktail or ice-cream. 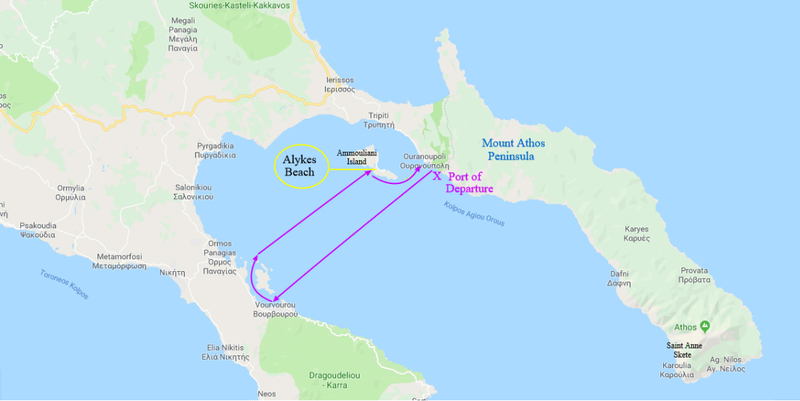 At 15:45 we are leaving this traditional Greek island and after 15 minutes of sailing, we are arriving back to the port of Ouranoupolis to disembark around 16:00. If you're staying in a hotel or room or apartment within a distance of 25 km from Ouranoupolis, you can take advantage of our pick up and drop off service with our company's air conditioned mini bus. Please contact with us well in advance to arrange your transfer.